Temperatures have hit the triple digits here and I’m looking for cool things to make for dinner – cool as in “let’s not heat up the whole house because then there’s no place to escape the heat”. 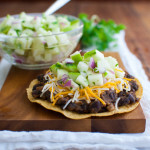 That’s where these black bean tostadas with green apple salsa come in. There is something about fruit salsas that make summer heat seem not quite so bad. They’re refreshing and light. The black beans do require a short simmer on the stovetop to really develop all the wonderful flavors from the garlic and spices. But the simmering time is short and you can snack on the green apple salsa to stay cool. The original recipe calls for serving the black beans and apple salsa over rice. I have made it that way many times and it is quite good. However, as evidenced by my recent blueberry streusel pancakes and beer battered fish tacos posts, I seem to be on a crunchy-is-better kick. So, I swapped out the rice for some tostada shells. If you have ever wanted to have nachos for dinner without actually having nachos for dinner, this dish is for you. You can make your own tostada shells in the oven but I went with the store bought ones this time (no point in making my air conditioner work harder than it already is). Now, all I need is a tall, cool drink. Combine apples, cilantro, onions, lime juice, and a pinch of salt in a small bowl; toss to coat. Taste and adjust lime juice and salt as desired. Set aside. Heat olive oil in a heavy skillet over medium heat. Add the onions and cook, stirring often, until softened, 6–7 minutes. Add garlic, chili powder, cumin, and paprika and cook, stir constantly, until spices are fragrant, about 2 minutes. Stir in broth and black beans; bring to a boil. Reduce heat to medium; simmer briskly, mashing some of the beans with the back of a spoon and stirring often, until sauce is thickened and most of the liquid is gone, 15–20 minutes. Season with salt, pepper, and more lime juice, if desired. Let cool slightly. To serve, spread beans on tostada shells. Top with cheese and apple salsa. Garnish with extra cilantro and lime wedges, if desired. Recipe adapted from Bon Appétit, January 2012. The measurements for the apple salsa are really flexible. Add extra onions, cilantro, lime juice, and salt to your preference. You can use either store bought or homemade tostada shells. See my recipe for easy tostadas for instructions on how to bake your own tostada shells. Thanks for the comment, Ruby. The green apple salsa is really good, isn’t it? I sometimes make extra salsa just for snacking. I made this tonight for dinner. Nom nom! I have to admit I was a little skeptical about the green apple salsa but it really does taste good. So easy to make and it’s vegetarian! My boyfriend liked it too. Thanks, sweetie! I thought you might like this recipe. So glad you got a chance to try it. This was delicious and so easy. This will go in regular rotation. I’m trying the recipe for Chicken Tinga tostadas tonight. I’m so happy to hear that. Glad you enjoyed them. Thank for you the comment and the 5 star review! Let me know what you think of the Chicken Tinga tostadas.